This lecture is committed to the explanation of the subject Immunosuppressive Antibodies. In section one, the educator discusses Immune Globulin Preparations. 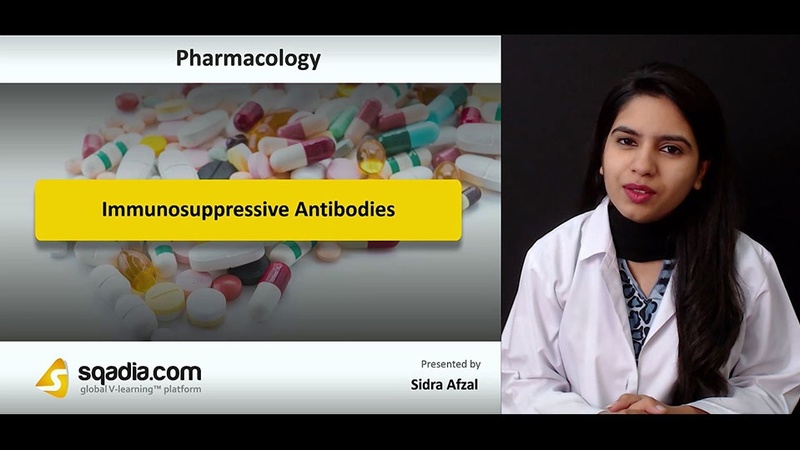 Firstly, a comprehensive overview of Antilymphocyte and Antithymocyte Antibodies is presented. The educator then progresses forward to explain Clinical Use of ALG. After this, light is shed on its Adverse Effects which is followed by an extensive elucidation of Immune Globulin Intravenous (IGIV). The educator then shifts over to the demonstration of Rho(D) Immune Globulin and also focuses on Hyperimmune Immunoglobulins. 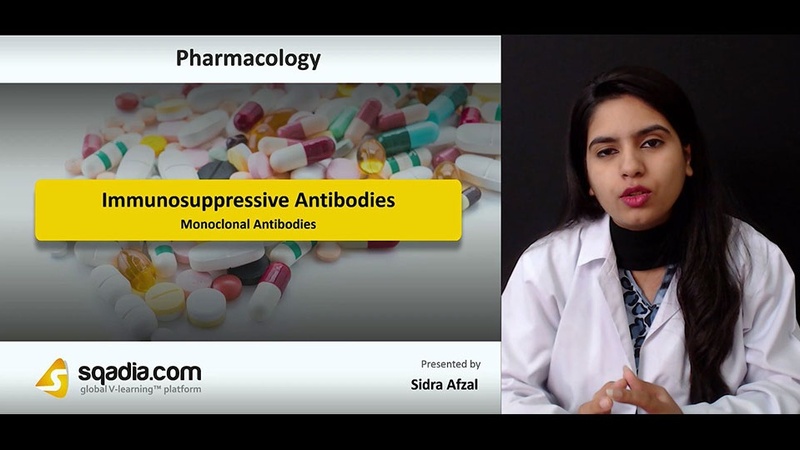 Section two is about Monoclonal Antibodies and includes the discussion on various kinds of Antitumor Mabs. The different Monoclonal Antibodies addressed by the educator in this section include Alemtuzumab, Bevacizumab, Catumaxomab, Cetuximab, Daratumumab, Elotuzumab, Dinutuximab, and Necitumumab. Section three refers to the topic of Immune Checkpoint Inhibitor Mabs. 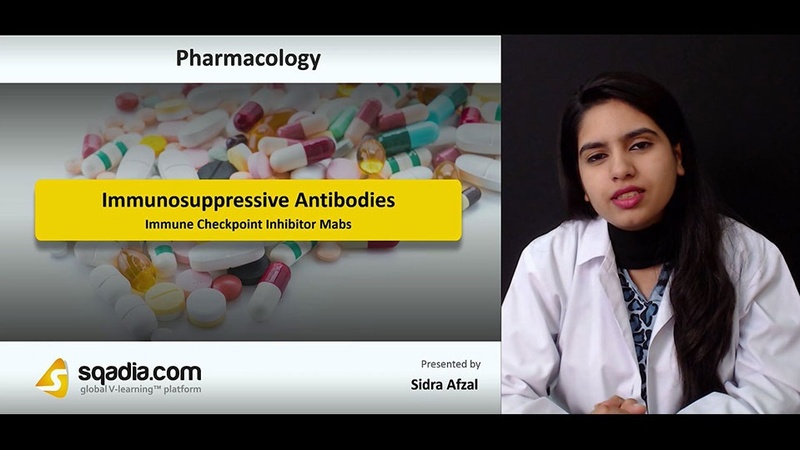 The educator primarily focuses on the description of numerous Immune Checkpoint Inhibitor Mabs available such as Ipilimumab, Nivolumab, Panitumumab, Pertuzumab, Ofatumumab, Rituximab, and Trastuzumab. Section four highlights Mabs and Fusion Proteins. In this section, the educator sheds light on the diverse range of Mabs and Fusion Proteins that exist. First of all, Abatacept and Belatacept are brought under consideration. Moving forward, the educator demonstrates Anakinra and Rilonacept. Afterwards, the explanation of Ixekizumab, Secukinumab, and Brodalumab is pursued. Subsequently, Reslizumab and Mepolizumab are reported followed by an elucidation of Basiliximab and Daclizumab. Apart from this, extensive information is put forth regarding Belimumab, Canakinumab, Natalizumab, Omalizumab, Ustekinumab, and Vedolizumab. Section five deals with the elucidation of Other Antibodies Preparations. The prime focus of educator in this section is to speak about numerous Other Antibodies Preparations such as Ado-trastuzumab Emtansine and Arcitumomab. To further explain this topic, the educator discusses other examples of this category which include Abciximab, Alirocumab and Evolocumab. Apart from this, detailed information is put forth about Denosumab, Eculizumab, Palivizumab, Ranibizumab, and Pegaptanib. The educator then concludes this section by shedding light on Obiltoxaximab and Raxibacumab.